MADISON -- In a sure sign of how messy Wisconsin Republicans' 2018 Senate primary has become, the Republican Party of Wisconsin yesterday issued a plea for U.S. Senate candidates to promise to support the party's eventual nominee. 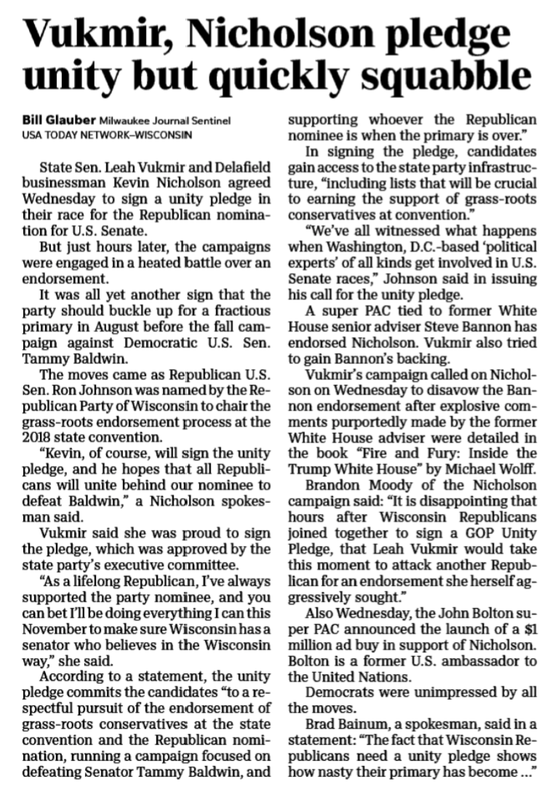 Soon after, we saw Republicans' cause for concern: almost immediately after signing the pledge, right-wing state Sen. Leah Vukmir and out-of-state billionaire puppet Kevin Nicholson went right back to attacking one another. Within hours of pledging unity, Vukmir called on Nicholson to disavow his out-of-state boss Steve Bannon over Bannon's attacks on the Trump family; which, in turn, caused Nicholson's campaign to fire back and accuse Vukmir of being... jealous. Wisconsin Republicans openly fear a repeat of 2012's disastrous primary, so they're scrambling to bring a pretense of unity to their increasingly divisive 2018 iteration. But it's all a waste of time: every Republican stabilizing effort to-date has hilariously backfired and only served to highlight Vukmir and Nicholson's escalating hostility and mutual disdain. BuzzFeed News: Steve Bannon’s Endorsement Was A Cherished Prize. Now, For Some Republicans, It’s a Liability.